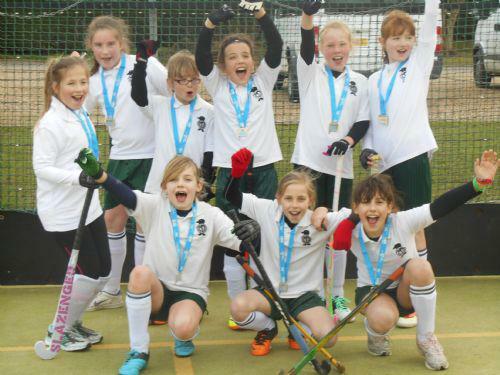 For the second year running Meath Green girls entered the U11 Surrey Girls School Plate IN2Hockey Championship hoping to improve on their creditable 5th place finish the previous year. This year the competition was held on a cold and windy, though thankfully dry, day at Cranleigh Senior School where the 9 girls from Years 5 & 6 were one of 13 schools (12 of whom were from the Independent sector) taking part. The girls showed their determination from their first match, winning it 5-0 and went on to compile a 5 wins, 1 draw record, to finish 2nd in their pool on goal difference. The semi-final against Tormead the runaway winners of the other pool turned out to be a one-sided affair with Meath Green running out convincing winners 5-0. 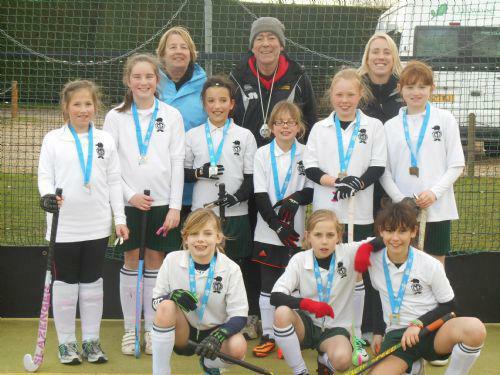 This set-up a final against Reigate St Marys, the team that they had drawn with in the pool matches. In a hard fought, end-to-end contest the girls weren’t quite able to raise their game to a higher level and when the final whistle blew St Marys were ahead 3 goals to 1. Though initially disappointed at not winning, all the 9 girls contributed to an exceptional performance, having in the space of 3 hours, played 100 minutes of hockey, scored a total of 30 goals whilst conceding only 5 (all to St. Marys!) which as their coaches pointed out meant they should be extremely proud of themselves and which was a just reward for all the hard work they have put in at the twice weekly training sessions.